Subject: Ezki's hobby thread: Space Elves and some... Mordheim! Hey and welcome to my hobby blog! I have been playing wargames since 2002. Started with Lord of the Rings miniature game after a friend of mine dragged me to Games Workshop. Grabbed a box of Minas Tirith soldiers and some paints. That's when I knew where all my weekly allowances would go. I was instantly hooked. I played that game for 2 years or so and collected some Isengard and goblin models on the side. Learned the basics of miniature painting (still have my first models laying around) and got some experience on playing the game. We played many games on my friends floor, using old cereal boxes as terrain and a rug as our playing field. Fun times. I was keen on trying the other games too, as many of my friends played either Warhammer fantasy battle or 40k. As I was very young back then (12 or 13? ), it was really hard for me to decided which army or game I would want to play. Money was tight back then, so I could not just go ahead and buy everything I wanted. So, at first I bought a box of high elf warriors, but after assembling and painting them, for some reason I was not happy with my choice. I think I sold them to my friend at that point. Later on when the battle for skull pass package (night goblins and high elves) was released, started a small Ork army. That force became quite large and I played a dozen or so games with it. At that time (2006-2007?) most of my friends had transitioned to Warhammer 40k. The game looked so much fun, but I still could not make my mind on which army to start. I mainly watched as my friends played or tried their armies. Every week I had decided a different army that I most definitely wanted to play. In 2008(?) the Assault on Black Reach box set was released for 5th edition. I though to myself that if I liked orks on Fantasy Battle, why not in 40k? So we decided to buy that box with a friend of mine and split the armies 50/50. It was not long that I took a break from the hobby. Teenage years and no interest in playing the games or painting the models, or something like that. This blog is where I continue my hobby story and share it with you guys. As the name suggests, this thread will display "a bit of this and that". So there is no one theme or project, I will be posting all kinds of stuff: pictures of my ongoing projects, finished models and maybe even some shots from recent games. Stuff I want to share with you, my fellow dakkanuts! Also the update rate will differ depending on how I progress and motivate myself to write stuff. I have noticed that It's hard for me to keep a consistent rate of updates for too long, but I will try to get back every now and then. I hope you enjoy the content here and I'm always looking for feedback: on how to get better at painting, taking pictures, writing a blog or anything else that comes to mind! It also motivates me to keep this up more regularly! - Play, play and play! Back to the hobby after a few years. Been too "busy" due to school, work, other hobbies and blah blah more excuses. I have not been able to play any games in 8th edition yet, but I really try to do that as soon as possible. In the mean time, gotta finish my unpainted Krieg models and some wip terrain pieces that lay around the house. Nice work so far, I really like the green-yellow sheme, it works very well! Got some more work done on the kabalites, just a little until they are finished (pictures then). Also, started painting my wyches, none finished yet, still figuring out the colors on them. I also got some work done with one of my eternity projects, the looted wagon. Got an old horrible looking rhino from a friend for half free, decided to try and turn it more orky. Have been stuck with that project ever since, and not even close to finish.. Anyway, built a crude looking sponson-like bigshoota on the side, and got some more paint into it. Whoa it's been a long time from my last update. Finally got some more worke done with the deldar thing, finished my kabalites and started working on the raider I have for them. I have always wanted to paint something sort of desertish, so I thought: "heck, why not these deldar vehicles then". They have a totally different color scheme compared to all the infantry, but I think they might blend pretty well together. Still in early stage, haven't added much details yet and the highlights on the front are still a bit too bright even for my tastes. Might add some weathering effects on the hull too. The weathering effects on the hull sound like a good idea, I really like the sail on that raider, very nice sir! I also like the dark green of your DE, suitably dark. Keep it up. I just need to figure out how to make those effects look good. 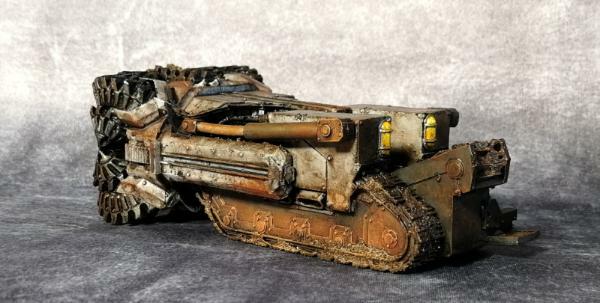 Usually been painting ork vehicles with rusty like stuff, so it's a new challenge this one. Decided to show you guys the new color scheme for my eldar vehicles I came up with. Tried to make it look sort of a night sky-like. Thinking of repainting all my eldar vehicles with the same way, already done so on the other falcon and a vyper jetbike. Subject: Re:Ezki's P&M blog - all sorts of stuff, update new eldar color scheme! Have been busy lately, so not much progress on the dark eldar project, other than few assembled models. Also I just bought two Venoms for the army. Trying to get them both assembled today and painted over the weekend. Got some more work done with the new eldar color scheme though, painted the other falcon and one vyper jetbike. Still got 3 more tanks and other vyper to go. That's actually a really cool colour scheme. Is it deceptively easy or difficult to do that? It's actually simple enough if you know how to use a drybrush, but pretty time consuming, especially making the "stars". Just needs alot of mixing different shades of purple. It's been a reeeeeeeaaaallly long time since my last update. Anyway, have been building a Death Korps of Krieg army lately. Color scheme is pretty basic dark grey ww1 stylish mix. Here are some pictures of the first tanks joining the army. Tried to make them fit the "muddy trench" warfare theme, with a lot of rust and worn paint. First time doing anything like this, so please tell me what I should have done more or less. Here's the first one, basic LMBT Greta. And here is a picture of the hellhound Nina. Subject: Re:Ezki's P&M blog - Update after a veeeery long time. Some Krieg. Bought some jetbikes for my Eldar force a while ago, and finally started painting them. Just got the "starpattern" done to all of them, the same one I use on my tanks. Still need to figure out how to paint the guardians riding them. Subject: Re:Ezki's hobby thread - 1000pts eldar force for thursday, more jetbikes! So, I'm trying to get a 1000pts eldar force fully painted for tomorrow, trying the list out at the games day at our FLGS. Everything else is pretty much done, just need to do some finishing touches with the jetbikes. When I can find a place where to take some decent pictures of the whole army, I will post some shots here. Using an empty cola can to make flags. The "Solitaire" mantleseer is pretty much done, just need to figure something out for the flag I have magnetized on the back. Wanted to make he's jetbike to stand out from the rest, but the seer himself follows the darkish purple theme of the army. Let's try this one more time lol. I have been out of the hobby for quite some time. Haven't painted anything in over a year, and for the last couple of years played maybe two or three games. "I don't have the time" is the usual excuse. So, as the 8th edition showed up, my interest has awoken once more. Finally decided to start modelling and painting again, and I wanted to share it with you guys. Lately I have been doing some terrain and painting one of the basilisks for my Krieg army. My Krieg army has grown quite a bit since my last update. Krieg is my main project at the moment. Really trying to finish all the models I still have unpainted (2 basilisks and one leman russ). Might even order some new units soon. Next up some artillery crew for the basilisks and more quad launchers. I'm going to try to update some images and stories here. Atleast from the games I hope to play in the future. Subject: Ezki's hobby thread - Back to hobby: Death Korps of Krieg update! Subject: Re:Ezki's hobby thread - Back to hobby: Death Korps of Krieg update! Thought about making some "rough" look for the guardsmen as well. Brushing some brown on their clothes sounds like a good idea. Finished my second Basilisk today. Here are some pictures from it. Pictures are pretty horrible, just tried to take a quick snap after painting. Quantity over quality on this update. And as I watch these images now, I see alot of things that need fixing. Still a bit rusty (heh) on the painting. Also ordered some more stuff for Krieg. Need to have little more artillery and finally got that Hades breaching drill that I have wanted for so long. Even bought some artillery crew to put on those basilisks, just to get them to look more "alive" and kriegish. Yeah, ordered 5 more so I will have 10 in total. Also got: quad launcher + crew and one pack of heavy artillery crew. I _really_ like the night-sky pattern on the Eldar vehicles (all the work here is terrific). Do you have a tutorial stashed someplace as to how you did it? I don't have any tutorials that I followed etc. The idea actually came to my mind when I was staring an space themed wallpaper on my pc screen in the middle of the night lol. So by trial and error I found a way to paint some sort of spacey night sky thing, mostly using drybrushing (technique I like to use a lot). "So basically I used different tones of purple, from dark to light and drybrushed them on top of black primer -> Start from dark and move to lighter tones step by step. The lightest parts and the dots ("stars" are pure white. Very minimal drybrushing on top of the purple parts. -> Make it look random. To finish things off, I washed the tank with a mix of purple wash and varnish + some water. -> Some of my tanks are matte and some washed with gloss, haven't yet decided which looks better. " And now I have decided, matte looks better. Maybe...? Found some time to grab pictures from all of the vehicles together. As I've been absent for quite some time, maybe it's justified to show progress with this army too. And as you can see, they do not look "that good" when observed up close. But on the battlefield between all the terrain they look pretty nice. As I'm not too good at painting shapes with freehand, I cheat a little bit with drybrushing etc. Also the horrible light I have makes those weapons look too bright. Still have the Eldar flyer unpainted. Maybe I should refresh my memory and try to paint that. Gotta stock up some purple paint though. Subject: Re:Ezki's hobby thread - Back to hobby: Death Korps of Krieg and some older Eldar models! And finally it's done, the third basilisk is ready for battle. They are still lacking some crewmen (already ordered). I think they will make these look a lot more dynamic. Now just to wait for the Forgeworld package in order to get more models to paint (like I don't have my cabinet full of those). I think I'm going to work on the other armies I have when their codexes finally arrive. Also taking some hints for better photos. I use my phone + any light I have at hand. Cannot by a better camera at this time. Subject: Ezki's hobby thread - Back to hobby: My older Eldar tanks + new Krieg Basilisks! I think the Wave serpents and Falcons look great. The Forge World package finally arrived, yay! Started by checking that every part is in decent shape and nothing is missing. After that, the parts needed some cleaning. Took quite a bit of filing to smoothen the edges. Image is after separating the parts from the casting. Paper was there to catch most of the dust from filing. Also applied some base coat for the thudd gun and Hades. Trying to get these bad boys assembled tomorrow. Subject: Re:Ezki's hobby thread - Krieg 239th Siege regiment gets reinforcements! Finally got to play my first game in 8th edition! Enjoyed it a lot actually. Played a 1500pts game, where the Krieg 239th siege regiment faced my friends very cool Death Guard zombie army. He works at our FLGS so we were able to use their gaming table during and after opening hours. The army I faced was very themed: 100 zombies aka poxwalkers, chaos spawns, zombie daemon prince, typhus and two maulerfiends(?). Pretty much the whole army was melee only and relied on sheer manpower and resilience. Very fun army to face if you are not playing too seriously. And I never am with Krieg. After 5 turns, the game ended at tie. My opponent scored first blood, linebreaker and slay the warlord, while I had linebreaker (thanks to Hellhound and Hades) + more objectives. Thudd guns were very effective at killing hordes, but my Leman Russ was a disappointment. Maybe it was the bad rolls, or it just is worse in 8th. Don't know yet. Also I'm pretty sad that Hades did not make a single close combat attack -> it was instantly killed by Typhus during MY charge phase(should have studied the stratagems before the game). I played like in 7th edition, trying to protect my tanks from everything that moves -> they are actually pretty resilient nowadays. Krieg are actually pretty decent in close combat (atleast against poxwalkers). USE YOUR COMMAND POINTS -> forgot this pretty much all the time. Subject: Ezki's hobby thread - Krieg 239th Siege regiment gets reinforcements! What's the deal with the Death Korps rules-wise compared to normal Imperial Guard? Something about 18" lasguns and higher leadership for infantry? Weapons and leadership values are the same, but they have an army wide rule, "cult of sacrifice", which let's all infantry ignore wounds during the shooting phase when testing for morale. Krieg guardsmen are also a bit better at close combat than normal guarsdsmen, as their ws is 3+. Also their orders are a bit more close combat oriented, for example: change their lasguns to pistol 2 or fight during the shooting phase. Painted the Hades Breaching Drill, engineers, thudd gun and it's crew. Also it seems I have totally forgotten how to paint cloth, as these are definetly not the best I've done. Maybe it comes back to me after enough of brushing. Tried a little lighter color scheme on this one. I found it very fun to do weathering effects on light grey. The metal on the drillparts looks a little sloppy though. It seems the paint behaves a little differently with resin models of this size compared to the hull of a leman russ for example. Even when primed. There are also some rocks and sand on the metal "belt" that comes from the drill itself, but don't show very well in these pictures. The bases (or the models in that matter) did not turn out the way I kinda wanted. The ground is a little too dark compared to other models in my army. 3rd gun of the battery ready to hammer the battlefield. Next up I need to finish the crew for the basilisks, they will be ready pretty soon! And the crewmen for basilisks are ready! These guys really add some life. And now these tanks look a bit more Kriegish. Shame I got some wrong hand pieces in the package, but I tried to make it work. The package also lacked the big artillery shells, so I have to contact Forge World if I could get them. The crewman holding his hands in the air looks a bit out of place without the shell. Now that I have painted all my Krieg models, time to fix the older ones. Couple of years of storage and moving from one house to another has taken it's toll on some of the models. There are numerous bent and snapped lasgun barrels that I have to repair. Also the paintjob on some of the kriegsmen is very underwhelming, as I painted them in batches on 20. 40 out of my 60 kriegsmen are made from the Gorgon Transport passenger models (I think you can't get them anymore?). It was a cheap way to get more infantry. Shame I don't have any pictures left from the project. Took a lot of cutting and greenstuffing though. Anyway, most of them look fine, but there are a few that are pretty horrible when observed up close. So I decided to order one more squad of advancing kriegsmen next month to replace the few "mutated" ones. Meanwhile I'm going to repaint few of the models that have been painted pretty lazily. Also repainting my Company Commander (marshal these days), as it's paintjob is not good enough for a model that pretty. I really like how you weather the steel on your vehicles- that burnished-bronze-brass look that says that corrosion or oxidation has been removed through the laborious and constant application of Brasso or Never-Dul; takes me back indeed! Really nice work and a great effect.